Organic Virgin Coconut Oil (Cocos Nucifera) - Sweetgrass&Rain Inc.
Virgin Organic Coconut Oil is created from fresh, ripe whole coconuts which are shelled and then peeled to remove the brown skin. The white coconut meat is then milled to fine shreds and dried at a temperature of not more than 100 degrees for an average of 2 hours and 30 minutes. This helps to evaporate the excess water. 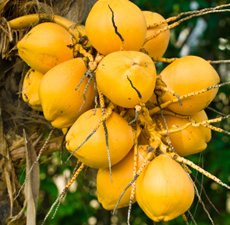 After drying, the milled coconut is passed through a customised, cold process oil press where the oil is separated at a controlled temperature of less than 100 degrees. The collected oil is pumped through a series of filters, which results in a clear coconut oil, known as Virgin Coconut Oil. The filtered oil is temporarily stored in a tank and passed through a final filter before it is ready for use. Because of this process the Virgin Organic Coconut Oil retains a wonderful fresh coconut scent and is an excellent moisturiser.